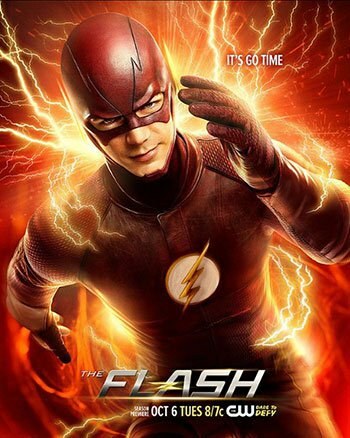 The Flash: Season 2, Episode 1 - "The Man Who Saved Central City"
This fabulous series has more in common with the comic book origins of these characters than with any cop drama. Early in the second season opener of CW's The Flash, Grant Gustin's Barry Allen (the Flash's alter ego) and Detective Joe West (Jesse L. Martin) investigate a murder at a nuclear facility. As Barry, a police scientist, examines the body for clues, we are given a quick glimpse of what The Flash could have been, of what it would have been had this series been made at any time other than this moment of ascendancy for the comic book superhero. All of the elements are here for an adaptation of the hero's adventures into a standard police procedural, a kind of CSI: Central City. Imagine Barry and Joe teaming up week after week, the gruff experienced cop and the rookie, to solve pedestrian crimes and arrest run-of-the mill villains. In every episode, Barry would be called upon to use his super powers at least once, but the show would have been indistinguishable from a dozen other police dramas. Then, the scene changed and I was reminded that The Flash is so much more than that, that this fabulous series has more in common with the comic book origins of these characters than with any cop drama. In terms of the characters themselves, this episode begins with a different status quo than last season's, a necessity since that season ended with everything almost literally flying apart. Now, Barry is working on his own and without the strong team of family and friends that he had come to depend on. He's struggling with guilt over his inability to save everyone from disaster, and is afraid that those he loves will be hurt if he lets them get too close. It's the kind of moping that we've grown accustomed to seeing from our superheroes and the sort of thing that Gustin's charming, light-hearted portrayal of Flash usually serves as an antidote. Meanwhile, Cisco (Carlos Valdes) has joined the police department where he works with Joe as a part of the new Anti-Metahuman Task Force. Caitlin (Danielle Panabaker) has taken a job at a place called Mercury Labs. Fortunately, by the end of the episode, all of this is satisfactorily sorted out and a new status quo is in place. Barry learns that he can't succeed without his friends, and the team is back together with Dr. Martin Stein (Victor Garber), one half of the superhero Firestorm, taking the place of Tom Cavanagh's Dr. Harrison Wells as the mature scientist-in-residence. In addition, one of Barry's major motivations from last season is resolved, if somewhat unsatisfactorily. As with last season, the drama is mostly kept pretty light. The problems presented within the series are generally standard fare, and the resolutions can sometimes seem a bit cloying. That is true in this episode as well, when I sometimes found myself wishing that Barry and the others would get over themselves and get on with the action. Any problems with the personal drama, however, are more than made up for by this amazingly likable cast. Gustin is a revelation as Barry Allen, and I can't get enough of Martin's Joe and Valdes' Cisco. I suspect that putting them together in the Central City Police Department is going to produce good results. I do find myself missing Cavanagh's Harrison Wells, who only makes a brief appearance in this episode. Hopefully he'll be able to return with all of his sinister charm intact. This week's villain is a character named Atom Smasher, played by WWE World Heavyweight Champion Adam "Edge" Copeland. He's suitably menacing and certainly physically intimidating enough for the part. He makes his first appearance just as the Flash is being given the key to the city by the mayor at the Flash Day celebration; the scene, which includes a crowd of spectators dressed in Flash t-shirts and carrying yellow foam lightning bolts, is right out of the comic books. The Atom Smasher is formidable, with the ability to grow to extraordinary size. The special effects for this villain look pretty good, which is becoming more and more important to viewers as standards and expectations change with the advent of the big budget superhero film. Atom Smasher's threat serves to bring the team back together, of course, and the team's interactions around the crisis provide a good way for the characters to work through some of their personal and interpersonal drama. It's all done well in a way that allows plot points and characterizations to unfold simultaneously. For comic book fans, the presence of the Atom Smasher provides a good hint about the big, cosmic story to come. Of course, an even bigger hint was given at the end of last season, when a winged helmet made an unexplained appearance in the finale. For that matter, CW has pretty much given it all away with their publicity campaign for the new season. Nevertheless, I still got goosebumps when golden-age comic book character, Jay Garrick (Teddy Sears), made his appearance. Considering all of the hints and all of the advanced publicity materials, I don’t think that I'm giving anything away when I say that the arrival of Garrick, who in the comic book world is the Flash of Earth 2, portends the introduction of the multi-verse, a central feature of DC Comics since the '60s. It also means that this season's big, cosmic storyline promises to be even bigger and more cosmic than last season's time travel--based, wormhole-creating plot. It’s gratifying that The Flash embraces its comic book origins; so much so that the series that actually feels like a comic book. (Avengers: Age of Ultron felt like a comic book to me too, but The Flash unfolds weekly and episodically, like a comic book.) In this episode alone, the Flash unveils a Flash signal (like the bat-signal, but with a lightning bolt instead of a bat) and gets a new suit that’s even more in line with his classic comic book look. For a comic book fan, it feels as if they’re making this series just for me. Heck, Grant Gustin even bears a striking resemblance to the version of Barry Allendrawn by comics great, Carmine Infantino.